My wife and I recently tried for the first time to make bread in our very own kitchen. My wife has never really baked in her life and I haven't baked since I was a little person dreaming of licking the chocolate chip cookie batter off the mixer beaters while my mother was baking. We have both being trying out easy recipes for a while with our general cooking for dinners and weekend meals. This time we are going to go all out and try baking. Yes baking more than peanut butter cookie recipes that a three year old could do (just with way more mess). We were going to try our own bread. My wife found an easy recipe online with simple instructions and a how to video to go along with it. We started the whole process yesterday (or is that last year?) with the preparation of purchasing the ingredients both food and utensil wise at Winners, Bulk Barn and No Frills. The only thing we didn't by was the seed topping seen in the recipe and the video above. We decided to see how the bread tasted before going to the expense of gussying up the bread with frills. Fast forward to today and the above photo is what resulted. 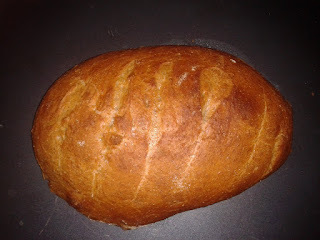 This evening for dinner we are going to enjoy a fine loaf of healthy Whole Grain Artisan Loaf.